Legislation Review – Do the Numbers Really Matter? About ten years ago I recall having to draw up a register of health and safety legislation for a manufacturing site. Despite it being quite a long list, the thing that struck me about it was how boring and generic most of the legislation sounded. I recall the pre-6 pack, pre-COSHH days of the 1980s when there were scores of very specific and rather elderly bits of legislation, particularly for welfare arrangements in certain industries and this got me to thinking, is it really relevant how many bits of legislation there are, or is it better to concentrate on the intent behind the legislation – sort of “never mind the length, feel the width”? Quality not quantity if you like to think of it that way. With the recent publication of the Löfstedt Report – an independent review of health and safety legislation – the spotlight has once again been on how many pieces of legislation we now have on the statute book and the Department for Work and Pensions has seized on the idea that sweeping away 50% of this legislation will make a dramatic difference to small business. I’m not so convinced. When the Workplace (Health, Safety & Welfare) Regulations 1992 came in as part of the “6-pack”, they revoked a myriad of old Welfare Orders, most of which had been around since the early twentieth century and were intended for specific industries. Let’s examine one of them – the gloriously named “Herring Curing (Norfolk and Suffolk) Welfare Order 1920”. Apparently during the autumn herring season some one hundred years ago, the population of Great Yarmouth could be increased by around 10,000 people, many of whom were women working 12-15 hours a day out in the open on the quayside, gutting and packing up to 800,000 fish daily. Sadly I cannot find a copy of the text of this venerable Order but I vaguely recall it had requirements like the provision of open fronted shelters (possibly with wooden seats) for the workers to take their breaks in. It might have been this Order or another similar one that required the employers to provide wooden clogs for the workers – anyway you get the idea! The 1992 Welfare Regulations swept away over 30 Orders like this one. Did this revolutionise small business? Did all those East Anglian herring curers (assuming there were any left!) say “thank goodness, now we can rip down all those wooden shelters we had to put up at huge expense and for goodness sake cancel next week’s clog order!” Of course not, because this isn’t about the numbers of rules and regulations, it’s about the intent behind them. So back to the present day then and the Government’s rather lop-sided focus on the amount of legislation we have. They seem to have got stuck on this 50% reduction figure, most recently mentioned by the Minister for work and pensions Chris Grayling in DWP Parliamentary questions this week. In contrast, Professor Löfstedt in his report suggested that the number of regulations might be reduced by about 35%. How is this reduction – whatever figure it actually is – to be achieved then, since apparently it’s such a significant issue for business? Firstly, Professor Löfstedt suggested that five (yes just five) piece of legislation could be done away with altogether as they were either no longer needed or were duplicated elsewhere. All those small businesses using tower cranes or celluloid and cinematograph film can cheer right now. Secondly, he suggested that some sector specific legislation could be combined and simplified. Annex D to his report lists over 75 pieces of legislation that could be subject to this process. The sectors and areas involved? Mining, Explosives, Biocidal Products, Genetically Modified Organisms and Petroleum Spirit. Not exactly earth-shaking for most small businesses is it? Finally HSE has recently started a consultation on the removal of seven out-dated statutory instruments. All good stuff but will revoking the 1971 Anthrax Prevention Order really have that much effect on small business? Despite all this the Government continues to trumpet the 50% reduction figure as though it will in one fell swoop remove 50% of the health and safety “burden” on business. Well it won’t. Certainly Löfstedt has also recommended a review of “the core set of health & safety regulations” to see if consolidation would provide “clarity and savings for businesses”. However he does point out that “Any consolidation would not reduce health and safety outcomes because there would be no change in the duties.” So it’s not about removing the burden of legislation at all, it’s about helping business to understand what they have to do. Why doesn’t the Government just say so instead of peddling meaningless figures? Last week Professor Löfstedt himself commented that he was concerned his review could be mis-used and said that he had not called for a significant change in legal policy. Meanwhile in the House of Commons, the Minister was saying “The Löfstedt report, — recommends significant changes to our regulatory regime”. Well they can’t both be right! So looking back at the Löfstedt report itself, here’s what the Professor said in the foreword; “I have concluded that, in general, there is no case for radically altering current health and safety legislation. 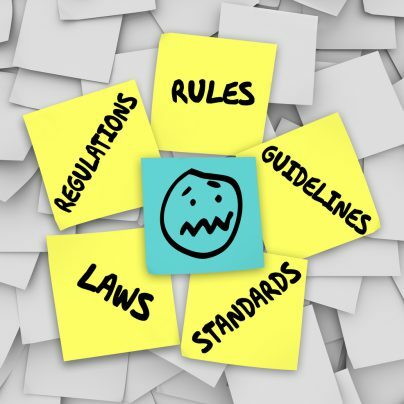 There is a view across the board that the existing regulatory requirements are broadly right.” Seems pretty clear to me, so why does the Government persist in spinning the report’s recommendations to suit what they want them to say? The truth is that it’s not the actual burden of health and safety that is the issue, but rather the perception of that burden, which is magnified and propagated by any number of silly stories about “elf’n’safety” that you can read in the popular press just about every day. Sadly, people really do believe the tosh they read in the papers and see on the TV. Work at Height Regulations? Oh yeah, the ones that banned ladders, right? Makes you want to weep sometimes doesn’t it? No wonder David Cameron thinks he has to deal with a “health and safety monster”. How do we go about tackling this problem? In the end it’s down to those of us who work in the health and safety profession to keep on telling people that ladders aren’t banned, that children can play conkers and climb trees and that risk assessment really isn’t all that difficult if you put your mind to it. We may not change the DWP’s viewpoint, or their obsession with figures, but we can help our clients and our employers to make their way through the so-called maze of health and safety red tape and come out on the other side with an actual understanding of how to manage and control their own risk. Perhaps then we can get people to see that health & safety can be an enabler for better business and not just a burden to overcome.